We are glad to offer a truly modern Mediterranean design experience, with spacious living that ensures homeowners a true seaside living experience. This is a new complex of amazing luxury bungalows is being built 200 meters from the sea on an elevated position, ensuring glorious sea views for each home. It is located in the Esentepe region of the North Coast. The properties are steps to the beach with easy direct access to the calm sea, perfect for swimming, paddle boarding, fishing or basking in the sun. The stunning infinity communal swimming pool merges into the crystal clear Mediterranean to offer a truly immersive coastal experience. The design intention is to provide comfort and style, while embracing the Mediterranean feel and scenery. The exterior showcases natural stones, crafted in such a way learned by generations of experienced stone masons. 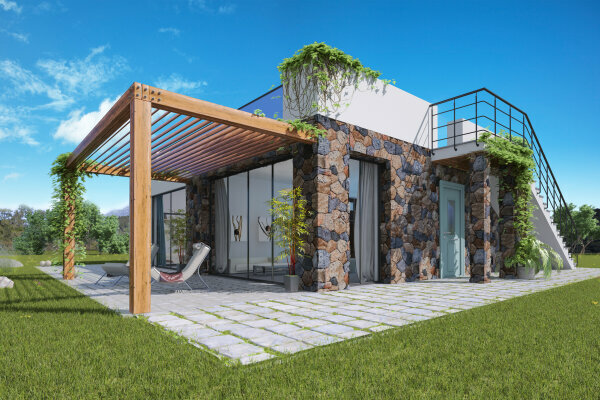 Combined with the traditional yet modernized wooden pergolas over the terraces, and aluminum windows - each element compliments the other to create a truly cohesive home. Comprised of 3 bedrooms and 2 bathrooms, the single level home has a spacious open plan interior. The master bedroom enjoys its own private ensuite bathroom and sliding doors to the sunny terrace. Each home will also enjoy a large 85 sqm Rooftop Terrace. Each homeowner will have the opportunity to choose from an attractive range of ceramic, laminate flooring, cabinetry, worktops, and wardrobes to personalize the property to one’s own style and taste.